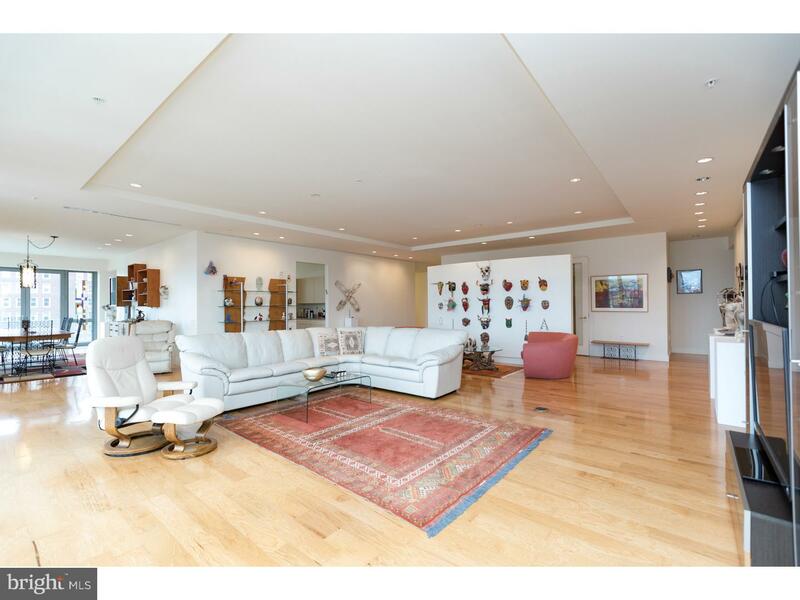 Rarely available entire floor showplace at the highly coveted 1706 Rittenhouse, only one-half block from Rittenhouse Square. This 3 bedroom plus den, 2.5 bathroom showcases 360-degree city views from walls of windows in all rooms. Enter the condominium directly off the secure elevator into a private vestibule. A set of French doors opens into a sun-soaked living room offering several gallery walls, space for multiple seating areas, a Juliet balcony and see-forever views to the south. Open to the living room is a formal dining room providing access to a 16' balcony. There is a chef's kitchen boasting a large breakfast nook, incredible cabinet and counter space, large breakfast bar, tile floor, granite countertops and commercial grade appliances including a Wolf range, wall oven and microwave and Sub-Zero refrigerator/freezer. The other side of the residence features a luxurious corner master bedroom suite with custom built wall and walk-in closets and a bathroom appointed in marble with a double vanity, private commode, soaking tub and seamless glass enclosed walk-in shower. One guest bedroom enjoys sunrise city views to the east and skyline views to the north with easy access to a full hall bathroom. The other guest bedroom was most recently used as an art studio and can easily be converted into a bedroom suite with the addition of a bathroom. There is recessed lighting throughout and there are hardwood floors in the foyer, living room and dining room and carpet in the bedrooms and den. Additional home highlights include a den/office, powder room, laundry room with utility sink and side-by-side washer and dryer, and a utility room with access to the service elevator. One parking space in the building's garage and one storage space are included. Residents enjoy amenities that are second to none, including a 24-hour doorman, automated parking garage, heated indoor pool, state-of-the-art fitness center, chauffeur driven 700-Series BMW and landscaped garden with Koi pond. Rittenhouse Square is ranked the 6th best neighborhood in North America by Places Rated Almanac. There are 175 restaurants and 199 retailers within a three block radius. 1706 is within close walking distance to the Market Street office corridor, The Avenue of the Arts and University City. 30th Street Station and Philadelphia International Airport are only minutes away.